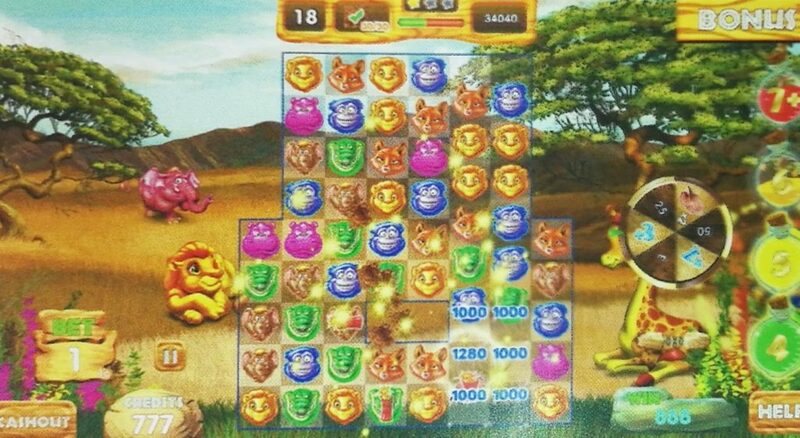 Synergy Blue’s games can be seen in action in booth 2823 on the G2E floor. 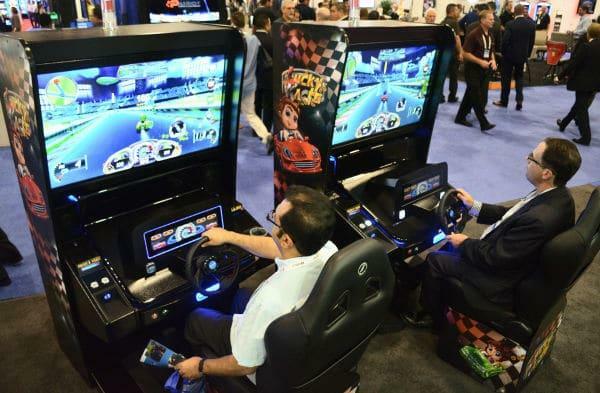 As a sucker for anything reminiscent of the arcades from the 1980s and ‘90s, arcade-style racing cabinets drew my eyes to Synergy Blue’s booth on the G2E exhibit floor. Once I sat down, I learned that Lucky Karts is a modern kart racing game that can be operated either as a skill-based or a pure chance slot game depending on the jurisdiction. Synergy Blue’s HAWG operating system, or Hybrid Arcade Wager-based Gaming, allows the game to run as either depending on the installed files. In Lucky Karts, players race their friends or the clock down any one of several race tracks. Rather than classic arcade components, Synergy Blue has opted for a simulation-quality wheel with built-in motors. As the player drifts into a turn, they can feel the wheel fighting back, and when the player is launched into the air, the wheel spins freely with no resistance. This creates an immersive experience and greatly shortens the trial and error a player typically experiences when trying a new game. As a racing game fan, I had a blast driving around during round one, rather than feeling as if the machine was simply eating my money. As the player drives around the track, there are gems and there are coins. Gems increase the player’s potential winnings, while coins are a wager. Conceptually for the player, hitting a coin is the approximate equivalent of pressing a button on a slot machine. Coins also “refuel” the kart, so if a player makes no wagers, the kart runs out of fuel. When the wager finally runs out, the player is shown an arcade style countdown – 10, 9, 8… – and can insert more money or take their winnings if they’ve had enough. Each of Synergy Blue’s games operate in a similar way – in addition to Lucky Karts they had Zombie$, a game where each zombie the player shoots is the wager. This similar structure between the games allows for a short learning curve, so the player quickly understands how their money is being spent and feels, ideally, that they’re getting a good value. The games are carefully designed to keep the player engaged for as long as possible while at the same time providing the revenue source that the casino needs. Synergy Blue also offers a bartop. In addition to traditional floor games like video poker, the machine offers more casual style games such as the puzzler Safari Match. Synergy Blue makes the revenue concept as simple as possible – when operated as a pure chance game, the game offers a standard return to player (RTP) percentage of 95. When operated as a skill-based game, this RTP can fluctuate between 75-95 percent. Thus, even the most skilled player can play as long as they want and the casino still gets their 5 percent.